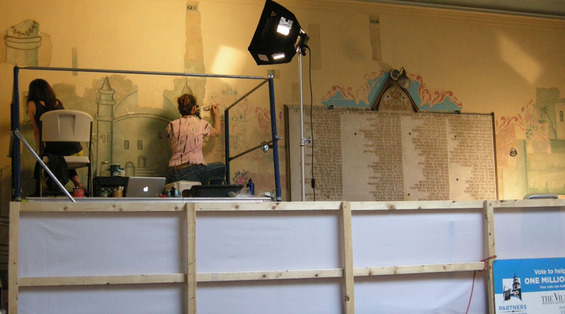 The Vilna Shul, Boston’s only Jewish historic site, has uncovered rare Eastern European style murals in the city’s last immigrant era synagogue sanctuary that may tell historians just as much about Jewish life in America as it does about Jewish life in Eastern Europe. Although three layers of murals were discovered under a beige overcoat in the late 1990s through a grant from the Amelia Peabody Charitable Foundation, substantial portions of the murals have only just recently been uncovered. This part of the restoration is being funded by the American Express Partners in Preservation program, a partnership of the National Trust for Historic Preservation and the American Express Foundation. Last spring, Vilna Shul was one of 25 historic sites around Greater Boston selected to participate in the Partners in Preservation program. This program allowed people from around the world to vote for their sites to receive funding. Thousands of people from around the world voted daily in support of the Vilna Shul. As a result, the Vilna Shul, a synagogue built in 1919 that is now used as a cultural culture community center and museum, received $90,800 in restoration funding. Art conservators began revealing all three layers of painted designs on the back wall of the Vilna Shul Women’s Gallery in mid February. Because no photographs of the building have surfaced from before the 1980s, the details of the murals are largely a mystery. By late April conservators had finished uncovering the more recent murals, and had come upon hebrew lettering on the walls. The writing indicates that the walls were originally painted with images of the second and third holiest sites in Judaism. The right side of the wall reveals the Cave of the Patriarchs, a holy site for Jews, Muslims and Christians. Located in the ancient city of Hebron, it is here that Abraham and Sarah, Isaac and Rebecca, and Jacob and Leah are said to be buried. The left side of the wall reveals the Tomb of Rachel, a site of pilgrimage along the ancient Bethlehem-Ephrath road, known as the “Route of the Patriarchs”, where Jacob’s second wife, Rachel died in childbirth. Although painted scenes were common in Eastern European synagogues and in places that Jews immigrated to, most have been destroyed or are badly in need of restoration work. Far less traditional, the second and third murals give insights into the progression and stages of Americanization among these Jewish immigrants. Visitors to the Vilna Shul this summer will get to watch as conservators continue to uncover these rare painted designs. Daily tours of the building will continue to be available, sharing not only the history and culture of Jews in Boston, but a behind the scenes look into the history, progression and conservation process of Jewish synagogue paintings. The Vilna Shul is located at 18 Phillips St. on Beacon Hill. It is open Wednesdays, Thursdays and Fridays from 11-5, and Sundays from 1-5. Tours on Mondays and Tuesdays are by appointment only. Admission is by donation. Picture is of the members of Gianfranco Pocobene Studio at work.